ARKMODEL's single-pump, sealed compartment kit for 1:72 China Type 039 Song Class. Already included servos, ESC, BCU. Sealing chamber kit (single pump cylinder) W7603GPK. 039 Song Class ARTR size/weight:1040x117mm/6028g(ARTR box) (finished product). 039 Song Class Kit size/weight:1100x140x220/4000g(Kit box). This WTC (single pump cylinder)is adapted to the C7603/Germany 1:72 China Type 039 Song Class R/C submarine and can also fit in similar size, single shaft submarine hull. This WTC equipped with piston tank ballast system. The WTC has large space , fit with T-socket RS232 and 24-pin sockets for function update. All parts made by inject ABS plastic/nylon, easy to assemble. All metal parts such as running set made by CNC precision sizing. Kit included all essential electric parts such as Piston tank & solenoid. Kit include all rubber seal parts. Kit include illustrated step by step instruction. This capsule assembly contains most of the parts needed to make a remote-controlled sub-sea capsule. Includes all mechanical and electrical equipment such as cabins, end caps, pumps, solenoid valves, ballast tanks, motors, couplings, output shafts, etc. 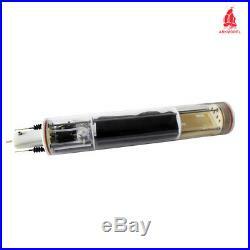 Electronic equipment such as servos, electronic governors, electronic switches, remote control devices, automatic depth gauges, automatic level gauges, batteries, etc. We are the original factory in China having our own R & D team and production line, keep providing reasonable price and quality. We are keeping doing better and better. All products have got design patents and certificate of CE, ISO9001, RED, EN71, ROHS. You can order now without hesitate. Thank you and enjoy your shopping time^-^. More Videos and photos welcome to check and follow our. 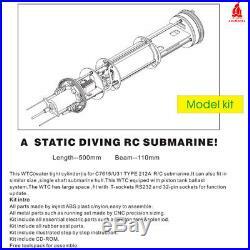 The item "Arkmodel 1/72 WTC Single PUMP TANK KIT OF China RC Submarine 039 Song Class KIT" is in sale since Friday, April 13, 2018. This item is in the category "Toys & Hobbies\Models & Kits\Boats, Ships\Plastic". The seller is "thor-robotics" and is located in Hangzhou.